Amanda Sevall Designs: Holiday Cookies: Round One! So yesterday, I finally stopped drooling over my favorite cookie recipes, magazines + cookbooks and started baking cookies! I decided to start out by making one new recipe and one favorite recipe yesterday. But you can also find it here on her website. 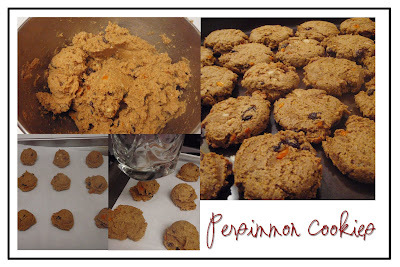 The second recipe is a family favorite, one that you can really only make this time of year when the fruit comes into season and shows up in the produce section: Persimmon Cookies. A form of spice cookie, almost like carrot cake, that is totally worth the effort in buying the persimmons and giving them lots of time to ripen on the counter! The recipe comes from my Mom's grandmother, "Nana Olson", and I love these cookies. Now I have to admit, I have altered the recipe slightly by adding the vanilla, mixing in stages (originally it was mixed all at once), using a cookie scoop and the step of flattening the cookies mid-baking, but either way they are really yummy! Scoop out with cookie scoop (about a tablespoon) onto a parchment or silpat lined baking sheet. Bake for 10 minutes at 350. Pull the cookies out of the oven and flatten using the bottom of a flat glass. Bake for another 4-5 minutes. Allow to cool on the baking sheet for at least five minutes before moving to cooling racks or serving plate. Makes several dozen cookies. I haven't tried, but I am tempted to whip up a little something to top them with - maybe a brown butter icing or a cream cheese frosting. mmmmmm.... maybe next year! In an attempt to provide some persimmon knowledge (by no means am I an expert), here is some extra info, tips and a step-by-step of preparing the persimmons for the cookies. When buying the persimmons, there are two types of persimmons: the hichaya and the fuyu. The hichaya is more bitter than the fuyu, but both need to be really, really ripe before using. The more ripe the persimmon, the less bitterness you will taste. This year, I used hichaya persimmons, which look more like an acorn. The fuyu have a tomato shape. When you buy your persimmons, keep in mind that each persimmon will give you 1/4 to 1/2 cup of pulp. I bought ours about 3-4 weeks ago, so it can take a while depending on how ripe they are when you purchase them. Here's how I prepare the persimmons and fyi... they are super sticky, so be prepared for really sticky hands! First, I cut off the top and slice the persimmon in half. Next, you scoop out all the pulp with a spoon. Basically, you just want to get rid of all the skin. Next, I dice the persimmon into small chunks. Consistency is kind of like chunky applesauce. Now you are ready to use your persimmon pulp! Measure the pulp and you will have to either (a) toss the excess or (b) adjust the recipe. Now my four persimmons this year gave me a cup and a half of pulp. I chose to adjust the recipe by multiplying the ingredients by 1.5. For the egg and the butter, I increased the proportions of those ingredients by using an egg plus one egg white, discarding the second egg yolk and a whole stick of butter. Turned out fabulous! I love the taste of persimmons, so I think maybe next year I will branch out and try one of the persimmon pudding recipes out there. Anyone got a good persimmon recipe?? Today, I will be making dough to freeze and planning out the rest of the cookies between now and Christmas. I know what I want to make, it's just the when to make it so that we don't overdose on sugar and have plenty to give away on Christmas. I love baking cookies at Christmas! You want a persimmon recipe? I didn't even know what one LOOKED like until reading your blog. Wow. You are really making me hungry. 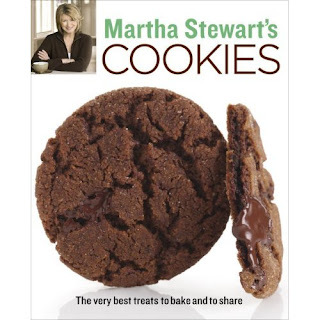 So, the Martha Stewart book isn't too . . .complicated? Whenever I open one of her recipe books, I get a little intimidated. I love that you posted pictures of the process! So fun to see. Both recipes look delicious. I just finished my lunch and you're making me hungry again. I will probably give both of these a try eventually.